One day last week during the Easter holidays we found ourselves with a spare day at home - a rare luxury! I asked the children what they wanted to do, and Mia announced 'sewing!' 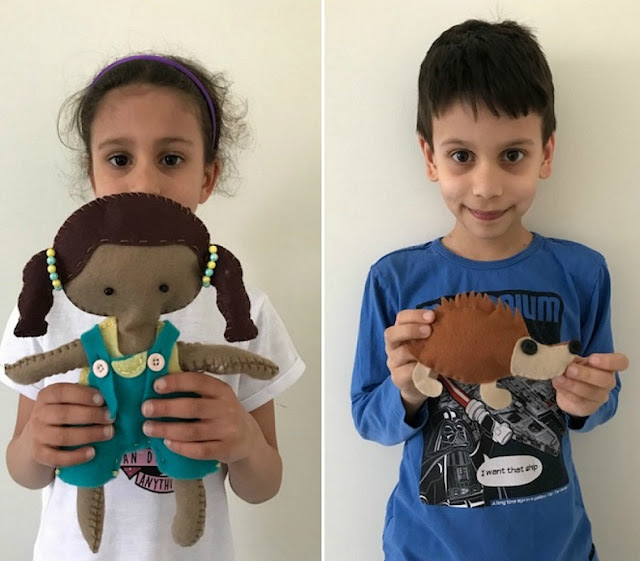 Luckily I had saved a sewing kit that she received for her birthday for just such a moment, so we took it out and started to sew together a gorgeous little felt doll. She was really patient with it, and although she wasn't able to manage it completely by herself she had a good go and we worked on it together. Harry started to get a bit upset, and I thought it was because he wasn't getting any attention. But it turned out that the reason was that he wanted to do sewing too, and no-one ever gives him any sewing kits. So I asked what he wanted to make, and it emerged that what he really wanted to sew was a hedgehog. We popped on to Pinterest and searched for felt hedgehogs, and found a design that he liked. After a bit of frustration I was able to help him draw up a pattern, and he designed a really sweet little hedgehog. I showed him how to make some pieces in paper first and then cut out the felt, and how the pieces fitted together to make his hedgehog. He sewed and stuffed it entirely himself, and he was so proud of himself - I think his hedgehog is lovely too! I also showed him how to sew on the buttons for his nose and eye, a very important life skill! It was a really lovely crafty morning together, I'm going to miss them when they are back at school next week!